BEST® Antarctic Krill Oil Complex! 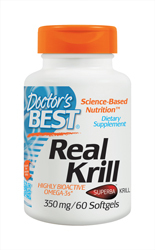 Real Krill, by Doctor's Best, is 100% authentic product from sustainably harvested Antarctic Krill. It provides omega-3 EPA and DHA linked into phospholipids, together with the versatile protective carotenoid astaxanthin. These nutrients are vital lipids, building blocks for the cell membrane systems that manage most of the important life functions. Real Krill provides them in molecular forms that have superior functionality over fish oils. Ingredients: (Per serving) Phospholipids, minimum - 140 mg, Omega-3 fatty acids, minimum - 80 mg, EPA (EicosaPentanoic Acid), minimum - 40 mg, DHA (DocosaHexaenoic Acid), minimum - 23 mg, Astaxanthin, minimum - 17 mcg. Suggested use: For maintenance, take 1 softgel per day, preferably with a small meal. To support mood management, take 2 sofgels per day. To support blood lipid management, take 3 softgels per day. Cautions: Not suitable for vegetarians. May not be suitable for individuals with seafood allergies.